The American ornithologist and botanist Robert Ridgway (1850-1929) encountered an almost infinite number of colours on his many voyages of discovery through the world of nature. In the course of time, he also became aware that the accuracy required for a scientific description of colours would only be possible through some form of standardisation. He therefore proposed a colour-system which was published in 1912 under the title Color Standards and Nomenclature. Ridgeway’s system exploits the possibilities of additive colour mixing. The basis for the required systematic order of colours is a circle subdivided into 36 pure, solid colours (full colours) which, from the perceptual point of view, are given approximately even spacing. This circle appears here as the outer circumference of the right-hand figure, which also reproduces the numbering from 1 to 71 as originally used by Ridgway. While each basic colour loses saturation towards the centre by means of the progressive, additive mixing of a medium grey, its hue remains virtually unchanged. 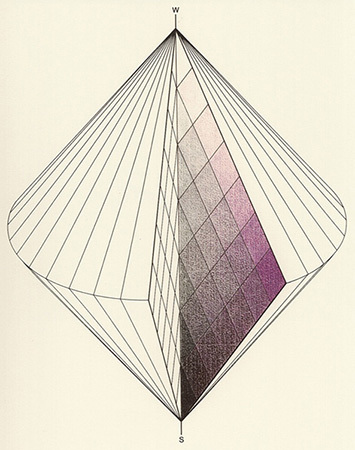 Ridgway achieves his set of colour standards by placing five steps — identified by concentric lines — between the outer ring of full colours and the central grey. In order to maintain their visual equidistance, the six concentric rings do not contain the same number of colours. Through progressive, additive mixing of white or black to each of the 159 colours within the full colour-circle, Ridgway eventually succeeds in attaining the three-dimensional diversity of non-self-illuminating colours. Three steps are involved in each direction. Towards black these are called shades, and towards white they are tints. Ridgway thus creates a register of 7 x 159 = 1113 colours which, with the two tips, give 1115 colour standards, intended for use in the identification of the colours of birds. Alternatively, the three-dimensional arrangement of these standard colours can be illustrated by the (dissected) double cone. The full colours are placed around the equator, with the grey colours running along the central axis from white through to black. Date: The American Robert Ridgway proposed a colour-system for identifying the colours of flowers, birds and insects in 1912. 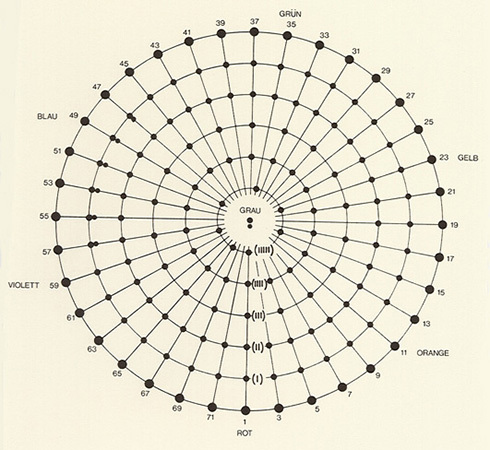 Bibliography: R. Ridgway, «Color Standards and Color Nomenclature», Baltimore 1912; G. Wyszecki, Farbsysteme, Göttingen 1960.